An 1868 illustration by Henry Doyle. Anne Kerny wailed and moaned as the Garrick sailed to America during the worst winter of Ireland’s Great Famine. Somewhere in the Atlantic, before the ship reached New York City on January 20, 1848, the cries of the baby she delivered also filled the steerage compartment. Bridget Kerny was not the only newborn of the 40-day journey from Liverpool. The Garrick was nearly a nursery, with 33 children born at sea among the 478 aboard, according to the Famine Irish Passenger Record Data File held at the National Archives and Records Administration (NARA). Two of the babies died before the ship nudged the dock. 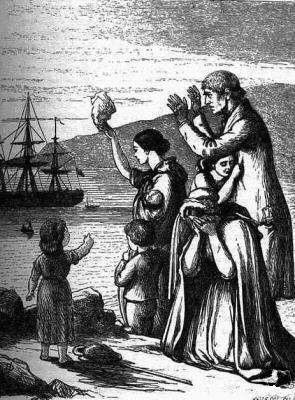 The online database shows 8,075 births at sea among more than 410,000 Irish passengers to arrive in New York from January 1846 through December 1851, the teeth of the Famine years. Of these newborns, 452 died, among 2,883 total reported fatalities. That’s a nearly three-to-one ratio of births-to-deaths, and an extra 7,623 passengers who did not embark from Irish or English ports. Read the rest of this story, which I just published in Prologue Magazine, the official publication of the U.S. National Archives and Records Administration. This entry was posted in History, Irish America and tagged Great Famine on April 18, 2018 by admin.